Nora has a problem, and her name is Claire, her overbearing society mother. On her 3rd husband, Claire cant' understand why her only child, Nora isn't married and providing her with grandchildren. All of Claire's friends have grandchildren, why can't she? When she meets John Blessing in the ER after a disastrous blind date, she feels its kismet. John is kind,considerate, wealthy and a doctor, someone who will give her mother bragging rights and hopefully keep her mother off her back. Suddenly their relationship is moving fast and out of Nora's control. Nora's having doubts...and Jean Marc Gaspard is certainly not the reason she is so distracted. Suddenly the outspoken woman Nora used to be is disappearing under her mother and fiance's opinions of how her wedding day should be. So when her Uncle Jack has an accident and needs her help, she jumps at the chance to leave New Orleans for Manchac. While there she realizes that her hatred for Jean Marc may be covering her true feelings, and maybe the real Nora is still inside herself. I love romances with a love triangle, though this was written more subtly. Acadian Waltz deals more with Nora's indecision, her worry that no one would have her contributing to her constantly quieting her voice when she's with John. But when she's around Jean Marc she has no problem being her regular self. When others who have known her since childhood constantly ask her if she's happy and in love, they all seem to doubt her feelings. My only problem is how long it seems to take Nora to realize that she doesn't love John. It was like, come on! You know you don't love him, drop him. This isn't a negative to the author, she just wrote the character's so well you hate John almost instantly. It's like when you're watching a horror movie and you're yelling at the screen for the female not to go upstairs, or into a certain room. At the same time, you can't look away. Nora's issues are relatable because none of us wants to be alone, even if we think where we are in life, in our career is exactly where we want to be, sometimes something happens and we reassess what it is we want in life. So when Nora meets John and he offers her what no one else has, marriage, family, etc she thinks she needs to act a certain way to keep him. 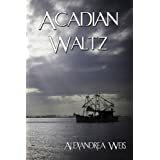 Acadian Waltz is the book you have to finish because you want to know how she gets rid of the guy who isn't right for her and how she'll get the man who is. A wonderful book with a lovely touch of the South and the charm and romance of New Orleans. Fours stars, four flames. Please feel free to stop by the other blogs tour for more!